Follow instructions: do all parts of the Deliverables, paying careful attention to seemingly trivial requirements (such as categorizing your blog posts correctly, formatting your code properly, etc.). Work must be handed in on time so that the entire class can get rapid feedback. The class is too large to make individual exceptions; however, you can grant your own exceptions by using “grace days.” Each week, you are allowed to use at most 1 grace day, which means you turn in any or all of your work up to 1 day late without penalty. The total number of grace days you may use is 3. Grace days are applied automatically until they are exhausted; subsequent late work receives a 25% penalty. No work will be accepted more than 24 hours late. Please avoid using all your grace days early in the semester. Things come up, including illness, where you may really need an extra day. If you suffer from an extended illness or have other problems that cannot be solved with grace days, you should see your advisor, who can help you coordinate make-up work in multiple courses. We will usually be happy to take your advisor’s requests and recommendations. The purpose of technical Assignments is to develop your fluency in programming concepts, and to reinscribe computational literacy skills through practice. Technical Assignments are submitted through Autolab. These assignments will have clear, crisply-worded checklists for what you need to accomplish. If you check off all the items on the checklist, and submit the work on time, you will receive 100%. 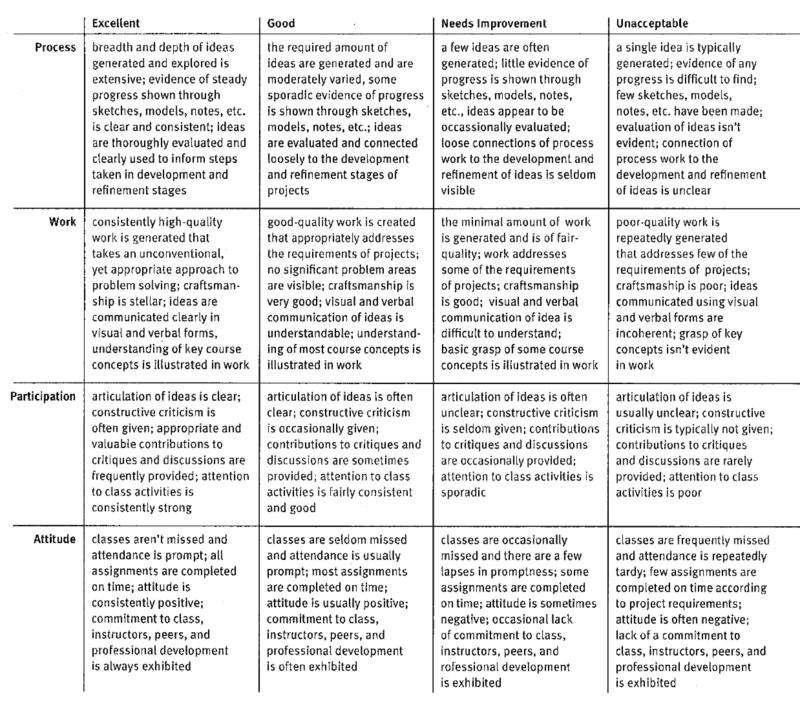 One of the components of this evaluation checklist will be style (e.g. modularity, effective use of data abstraction, readability, commenting, etc.). Your code should be properly annotated with comments that are well-placed, concise, and informative. 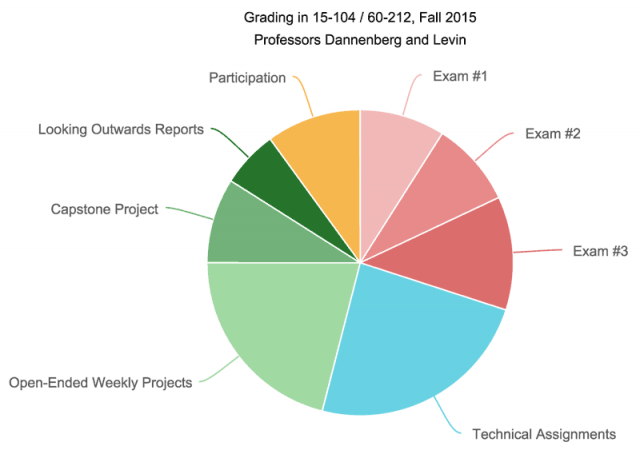 Your assignments will be graded by your TA, and at times by your professor. Wherever possible, we have designed Assignments to produce visual or audiovisual results, in recognition of the interests of an arts-oriented population of students. In spite of the checklist and detailed requirements, Assignments have room for creativity and do not have unique solutions. Just as harmonizing a chorale in music theory is a routine technical task, there is always room for invention and artistic choice. Do not think for a nanosecond that everyone is arriving at the same solution or that it might be OK to copy another solution just this once. The technical Assignments are given to strengthen and assess your skills as an individual. Collaboration on technical Assignments is therefore not permitted. Moreover, Assignments submitted through Autolab are automatically proofed by a sophisticated plagiarism detector, before being graded by a human. See the course policies on Academic Integrity for more information about this. The purpose of open-ended Projects is to provide well-circumscribed opportunities for you to make creative work with code. Generally the Project prompts will invite you to explore a specific conceptual theme or set of programming techniques, but, unless stated otherwise, there is no correct solution, and no specific requirement for how to implement your idea. While an Assignment asks for a creative solution, a Project also asks for some creativity in defining and approaching the problem. Projects are published presented on the WordPress blog. With Projects, it may not matter how much time someone spent; you may sometimes observe a quickly-executed solution which succeeds because of its strong concept. Often, however, the craft of a project is rewarded by extra attention. Embed your interactive p5.js project into the post. Make sure its code is visible. Include a static documentation image, such as a screenshot. Embed a YouTube, Vimeo, or animated GIF demonstrating your project. In your writing, include some critical analysis of your project: how could it have been better? In what ways did you succeed, and in what ways could it be better? Name any other students from the class with whom you collaborated on your Project, and explain how the work was distributed among the collaborators. Cite and link to the sources for any code, external libraries, or other media (e.g. photographs, soundtracks) which you used in your Project. Projects will be graded with scores of 0,1,2, or 3. 3 – Outstanding or exceptional work. Perhaps 10% of the class will earn this grade. 2 – Good work, successfully meeting criteria. Generally 75% of the class will earn this grade. 1 – Mediocre, unimaginative work, perhaps only technically satisfactory. Sorry. The work reveals a lack of evident care. Sometimes 10% of the class will earn this grade. 0 – No credit, generally because of late work. Our experience is that this grade is earned by approximately 5% of students. The purpose of Assignments (LO) reports is for you to become familiar with the landscape of contemporary practices in computational new media, and to begin to articulate your own set of interests and concerns within that landscape. To that end, your ten Looking Outwards reports will form a kind of “research diary”. The Looking Outwards reports, taken together, comprise 10% of your Deliverables grade. Each Looking Outwards report will earn 1 percentage point, up to a total of 10. LO’s are given a grade of Pass (1) or Fail (0). Decent reports submitted by the stated deadline will pass. Overdue and/or shoddy work will fail. Your LO blog post is well-titled and correctly categorized. Your writing is careful and considered. You may be occasionally asked to discuss or present one of the projects you reported about in a Looking Outwards assignment. * For students in 15-104, “Participation/Engagement” will consist of a weighted combination of Lab attendance and Lab participation.